Meet Blair and Danica Doyle and their 3 children: Cassidy, age 8; Lexis, age 3; and Addison, 18 months. They represent the many people living in rural areas whose poverty often goes unseen as well as the growing proportion of workers struggling to make ends meet through part-time and temporary work. The family lives in Redberry no.35 in Saskatchewan, a rural community with a population of 342 and an unemployment rate nearly double that of Saskatchewan as a whole. Originally from Regina, the Doyle’s moved into Danica’s childhood home in Redberry after the passing of her father, just before the birth of their third child, Addison. Moving into her childhood home allowed the family to realize their dream of home ownership and gave them considerably more space. Both Blair and Danica worked primarily in Battleford, SK (about 1 hour’s drive from Redberry), until Blair, a non-unionized tradesperson, was laid off last year. Danica is a self-employed personal support worker who has several clients in surrounding areas. She works for minimum wage at hours that fluctuate between 25 and 40 hours weekly. Once they moved out of the city, they quickly realized that they would require two vehicles: many of the services they accessed in the city were accessible by public transit or were close enough to allow them to coordinate with one vehicle; now, however, a visit to the medical clinic means at least a 20-minute drive to the nearest town, where they have been unable to find a family doctor. Other services require an hour’s drive to larger cities. Last year, when Blair and Danica were both working, the Doyles’ income was over $80,000; as a result, their monthly Canada Child Benefit is much lower than what it would be based on their current situation. Currently, Blair is at home with the two younger children, Lexis and Addison; the family had to pull them out of daycare once savings and Employment Insurance were maxed out. Blair is currently looking for work, but has been unable to find anything steady enough to afford the full-time childcare they would then require; even once all their children are in school, they will have to pay for before and after school care to allow for the travel time required to get to and from work. His search is further hampered by their lack of access to high-speed internet. Living with this degree of precarity is extremely stressful for the Doyle family; from month to month, their income shortfalls can range from $680.59 to $173.56 based on the number of hours worked per week by Danica, affecting their ability to put food on the table. Furthermore, these deficits increase if there are any expenditures outside of their monthly budget. Food insecurity is a consistent problem in rural communities, including in Saskatchewan, where outside of the north, the food costs for a reference family of four are lowest in large and small cities and highest in the rural areas. Many rural communities and First Nation reserves lack local grocery stores and appear to rely on food available at gas stations, convenience stores or local general stores. $19,588.20-$23,768.95 below the poverty line (annual after-tax low-income measure). If this family of five lived in a Northern community in Saskatchewan, the cost of their nutritious food basket would increase by about $300. 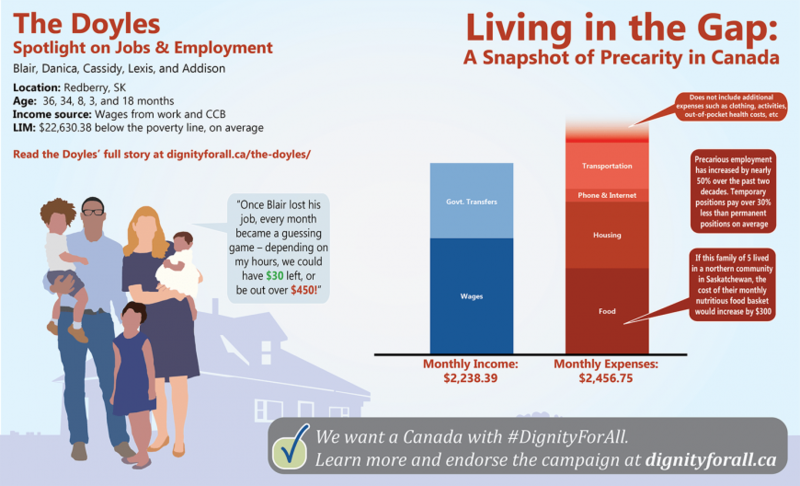 51% of people living in poverty are part of the Canadian workforce; 37% of low-income families are considered “working poor” with at least 910 hours of employment annually (approximately 18 hrs/week). Precarious employment has increased by nearly 50% over the past two decades. Temporary position are paid, on average, over 30% less than permanent positions. Racialized and Indigenous workers, workers with disabilities, and LGBTQ workers are all disproportionately represented in low-wage precarious work. Between 1981 and 2014, the rate of unionization fell from 37.6% to 28.8%, with most of the decline occurring in the 1980s and 1990s. Shifts from jobs and job creation with high unionization rates, such as construction, to jobs with low unionization rates, such retail and professional services, played a major role in this decline. At 20.3%, Alberta has the lowest unionization rate in the country. In a country as rich as ours, it is unacceptable that so many workers lack adequate benefits or security. Add your voice to over 12,000 individuals, organizations, and government representatives who support Dignity for All’s comprehensive, rights-based anti-poverty plan. Together we can work towards a poverty-free Canada. Check out Dignity for All’s one-pager on Jobs and Employment for more information.